The Budapest Spring Fair awaits visitors at four locations (at Fővám tér, Deák tér, Városháza park and Dunakorzó) between 5 and 28 April with handmade, traditional and design products, as well as delicious dishes related to the Easter celebrations, creating a true carnival atmosphere. Budapest Card offers even more discounts from April! 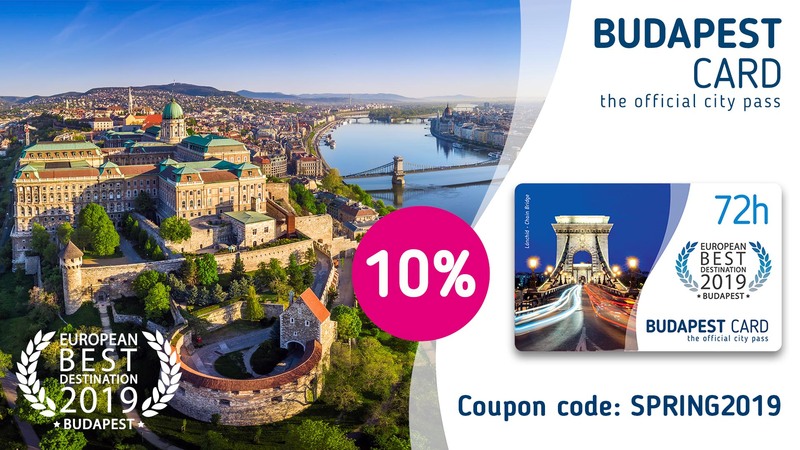 In addition to our free and discount offers, you can receive a 10% price reduction on your Budapest Card if you purchase the card online between 1 and 30 April. All you need to do is provide the coupon code SPRING2019, and you’ll get the discount. This spring we’ll be joined by new partners, so it’s worth to taking a look at the list. The spring edition of Budapest’s Finest brings you to BigWall, the biggest wall-climbing complex in Central Europe. A wall area of 450 square metres allows you to conquer dizzying heights. The magazine is visiting Újpest, and one of the newest cultural sights in the Hungarian capital. The event complex in Újpest (UP) was built on top of a market with an excellent food selection. The Metrodom housing complex, to be built close to the Danube, could represent future homes with smart technical solutions and greenery growing from the walls. The beauty of the capital captures travellers’ hearts even in bad weather. A guided city walk is the best choice for those who are curious about the stories of breathtaking buildings, hidden inner courtyards, small businesses, and picturesque parks, or those little secrets invisible to passers-by. To get better acquainted with a city, a country or a people, it’s worth getting to know the cultural traditions that have shaped people’s lives and formed their way of thinking over the centuries. What is this? Known in China for 5000 years, this drink arrived in Europe in the early 1600s; the British drink it instead of coffee and there are more than 3000 varieties. It’s tea, of course. Now, as the days are getting shorter, the leaves are turning yellow and it will soon be time to get the winter coat out of the cupboard. We need something warming, something that lifts our spirits or even heals us. Let there be tea! Here’s our guide to tea in Budapest. Budapest Card - Get the most out of your stay!